MEXICO CITY -- Infamous Mexican drug kingpin Joaquin "El Chapo" Guzman, who twice escaped from maximum-security prisons in his country, was extradited at the request of the United States to face drug trafficking and other charges and landed in New York late Thursday, a federal law enforcement official said. Guzman, the convicted leader of the Sinaloa drug cartel, one of the world's largest drug trafficking organizations, was expected to spend the night in a New York jail before his first appearance in a federal courthouse in Brooklyn on Friday, said the official, who wasn't authorized to publicly discuss Guzman's case and spoke on the condition of anonymity. Mexico's Department of Foreign Relations announced Guzman was handed over to U.S. authorities for transportation to the U.S. earlier Thursday, the last full day of Democratic President Barack Obama's administration and a day before Republican Donald Trump's scheduled inauguration. Guzman was taken into custody by the U.S. Drug Enforcement Administration in Ciudad Juarez, a border town across from El Paso, Texas. The DEA took him via plane to New York, according to a senior U.S. official not authorized to be quoted by name. Guzman, who's in his late 50s, first escaped from prison in 2001 and then spent more than a decade on the run before he was recaptured, only to escape again in 2015 via a mile-long tunnel dug to the shower in his cell. The 2015 escape was highly embarrassing for the government of Mexican President Enrique Pena Nieto, and Mexican officials were seen as eager to hand the headache off to the United States afterward. A court denied Guzman's appeal and found his extradition was constitutional, the Mexican Department of Foreign Relations said. Guzman's lawyers had fought extradition since his 2016 recapture and said Thursday the Mexican government sent him to the United States to distract the public from nationwide protests over gasoline prices. "It was illegal. They didn't even notify us," lawyer Andres Granados said. "They handled it politically to obscure the situation of the gas price hike. It's totally political." After his most recent escape, he became something of a folk legend for a segment of Mexico's population for his defiance of authorities. He was immortalized in songs known as narco-corridos, ballads about the drug trade and drug bosses. It was while on the lam a second time, in fall 2015, that he held a secret meeting with actors Sean Penn and Kate del Castillo. 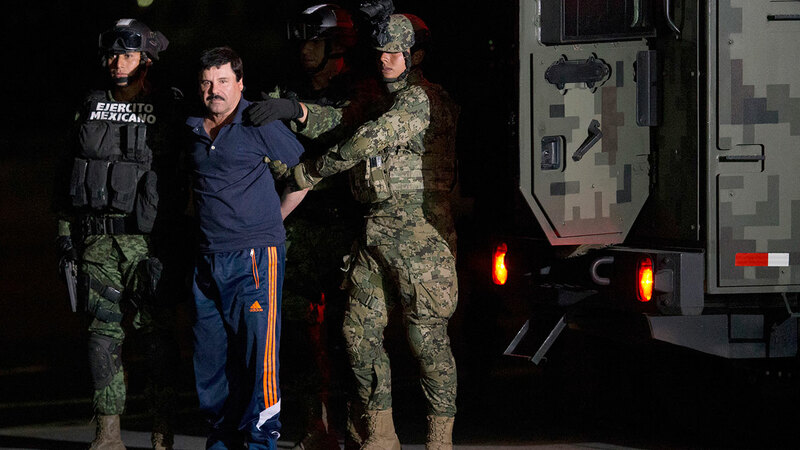 The encounter was the subject of a lengthy article Penn published in Rolling Stone last January, right after Mexican marines re-arrested Guzman in the western state of Sinaloa. "The only way to have money to buy food, to survive, is to grow poppy, marijuana, and at that age, I began to grow it, to cultivate it and to sell it. That is what I can tell you," he was quoted as saying in Penn's article. Derek Maltz, who headed the DEA's Special Operations Division until his retirement in mid-2014, said the timing of Guzman's extradition less than 24 hours ahead of Trump's inauguration could be seen as a show of good faith by Mexico. Associated Press writer Peter Orsi reported this story in Mexico City, and AP writer Bradley Klapper reported from Washington. AP writers Alicia Caldwell and Eric Tucker in Washington and Mark Stevenson in Mexico City contributed.